New Dino Wars out now! While the official launch date was latst Friday, I was busy with my Dad’d birthday so I was away from the old PC for a bit. But here it is! The long awaited (well, 6 months or so) sequel to the first book, Dino Wars: The Trials of Terror is now available everywhere. 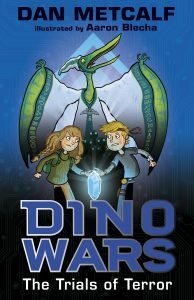 Another great bit of news is that Dino Wars will now be out in Germany, published by the amazing Egmont. One happy authot here! Check out danmetcalf.co.uk/dinowars for more!